The famed Park Avenue Tunnel in midtown Manhattan has been closed to pedestrians for nearly 180 years. Over three weekends this August that changed. 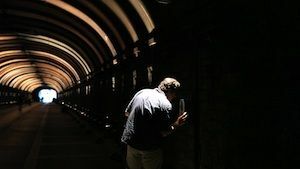 A dramatic art installation took over and the city closed traffic for the first time to make way for “Voice Tunnel,” an incandescent, echoing and interactive art show from artist Rafael Lozano-Hemmer. Lozano-Hemmer’s vision was to stimulate the senses through light and sound to create a “concert of voices” as participants walked through the 1,394-foot cavern, with each visitor contributing a unique spoken word message. And from reports, it was an anything goes experience. The artist achieved his goal through assistance from WorldStage, the audio, video and lighting rental company. WorldStage ultimately delivered a comprehensive, synchronized audio and lighting experience, with Audinate’s Dante network supporting long-distance, low-cost signal distribution for 78 discrete audio channels across 150 loudspeakers. Visitors entering the tunnel at 33rd Street were invited to deliver short messages into a silver intercom positioned before the halfway point. These messages were repeated across clusters of four loudspeakers arranged at six-foot intervals along the remaining length of the tunnel. Custom software, written especially for the event by Lozano-Hemme’s team, captured and processed the messages from a single computer before re-injecting them into the Dante network using a Focusrite Rednet PCIe card. The amplification triggered 300 spotlights that complemented the intensity of the voice behind the message. The lighting modulation patterns tracked the position of their specifically related messages, all the way through the tunnel until they played over the final loudspeaker cluster. According to Kate Brown, audio engineer at WorldStage, using Dante easily met the challenges of supporting high discrete channel counts over long distances. The Dante network consisted of 1.5 miles of single and multimode fiber, and the minimal infrastructure requirements and low cable count also helped WorldStage keep overall costs in check. Brown notes that the savings in infrastructure and cable count translated to savings in the number of specialists required to set up the show, pointing to the safety and environmental benefits (including lighter trucking requirements) of using fiber instead of copper. Importantly, WorldStage leveraged off-the-shelf Cisco switches to further simplify installation. WorldStage’s video and lighting departments already had large stocks of Cisco SRW and SG Series switches, as well as fiber optics and the necessary modules to connect the switches. WorldStage additionally used Dante-enabled Yamaha RIO digital stageboxes and Stewart Audio NetAV I/O 2x2 networked accessories to support audio signal distribution. The RIOs provided exceptional output density for the long-distance distribution requirements, while the Stewart I/O boxes were used specifically for monitoring voice messages from the control room. The Stewart Audio boxes incorporate Audinate Dante Ultimo technology, which specifically addresses networked audio products requiring low channel count support with its 2-in, 2-out interface. Lozano-Hemmer passion for providing an interactive installation for people to enjoy life with their voices created some technical challenges to ensure that frredom of speech did not conflict with public safety. Lozano-Hammer and the NYPD worked out a solution which delayed the transmission of the voices to protect against false alarms. Overall, the project proved a unique and interesting study on how integrators can best manage costs and infrastructure for projects with high capacity, manipulation and signal distribution demands.